Help us make a real difference in the lives of people living with devastating neurological diseases and disorders. Register (step-by-step registration guide) for the 2017 Scotiabank Charity Challenge, which will take place on April 22-23, 2017, at Parc Jean-Drapeau. Complete a 5K, 10K, or 21K walk/run! Children can participate in the 500 metre dash! 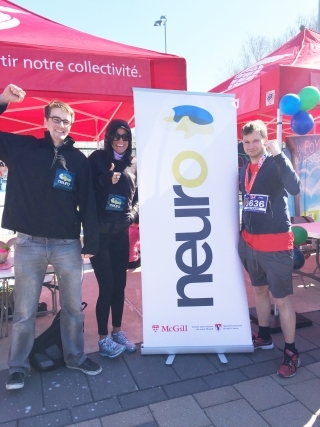 All funds raised will help advance The Neuro’s cutting-edge research programs and life-saving patient care. We hope to see you at the starting line! Your Chance to Win a Rolex… and More! Thank you to you Josie Arcobelli and her family for their commitment to making a difference! Join the I Medici di McGill Orchestra for a concert on April 1, 2017, to benefit Parkinson Quebec. The event will launch Parkinson’s Awareness Month, and will feature an afternoon of French music by Gabriel Fauré, Georges Bizet, and Ernest Chausson, with violinist Joshua Peters. The concert will be under the direction of Maestro Gilles Auger. Tickets available online, and at the entrance.